1 – Custom 90” x 28” double side serving window, mill black paint c/w sliding glass and screens. 1 – 24” x 102” custom stainless steel countertop c/w 4” backsplash. Stainless steel sinks and hand basins have been welded and polished into the custom top. Sinks are positioned to allow for a drain board at one end. 1 – 24” x 124” work counter c/w shelves, accessible plumbing doors finished in linoleum and polished aluminum. 1 – Custom stainless steel removable counter that fits into the 3-compartment sinks for additional working space when sinks are not in use. 1 - 17” x 22” screened crank-open style access roof vent. 2 – 16” Acme thermostatically controlled exhaust fans c/w an 8” aluminum valance. 1 – 35-gallon custom aluminum, wastewater tank. City water inlet, shut-offs, and interior waterlines supplied, and exterior sewer dump c/w 10ft. discharge hose. 2 – 72” x 16” ceiling mounted proofing racks c/w 36” invoice order holder. 1 – 5/lb fire extinguisher c/w mounting bracket. 1 – 24” x 36” permanently mounted combination easel-corkboard. 1 – Kitchen clock (battery operated). Painted and decaled – customer to supply paint colors, logos and artwork. We deal directly with a variety of authorized truck dealers throughout the USA and Canada. We work with the customer and locate a truck to meet their size requirements. We recommend one-ton, aluminum, dual wheeled step vans, gasoline only with 4-speed automatic transmissions. Chevrolet, Workhorse or Ford chassis. Used trucks may range in years from 1998 – 2006 with low mileage, well maintained and in good condition. All USA and Canadian trucks must conform and meet US DOT, EPA and Transport Canada guidelines. The engine, transmission and drive train will be thoroughly checked over and serviced. The tires are removed and the trucks are mechanically inspected from front to back. We will tune up the engine, check all batteries, belts, rebuild the starters & alternators, check the exhaust system, tires, braking system, seals, u-joints, fuel lines, etc. to ensure that everything is in good working order and meet all safety inspections. depending on size and year. A variety of pizza small wares; pans, screens, paddle, scale, etc. If customer requires different styles of equipment, trucks may be modified. Customer can also supply their own new or used food equipment. We will require a copy of your corporate logos, artwork and paint colors as our graphics company will do a mockup model of your truck or you can supply us with a mockup model. We allow $1,500 dollars for standard decaling. If the customer requires additional decaling, price to be discussed. Our graphics company will work closely with the customer in designing the graphic layout. The customer has the option to pick up their own unit. We handle all customs and border crossing administration in Canada and the United States. We recommended travel at 55mph, approximately 500 miles a day for optimal fuel consumption and engine care. We offer international shipping outside North America. 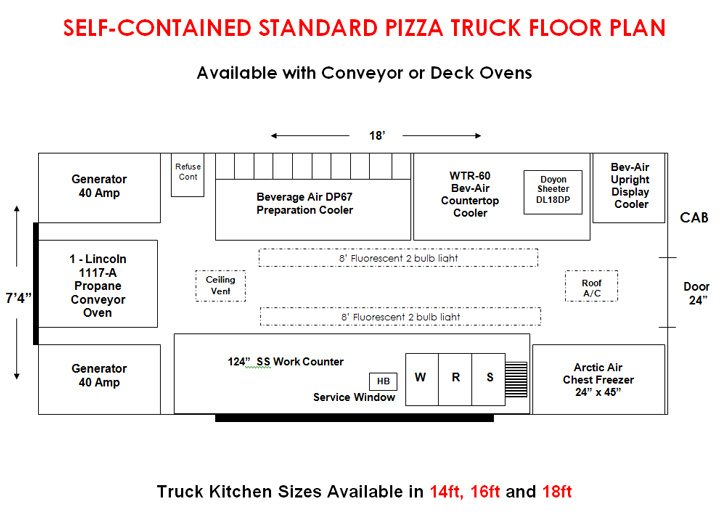 Pizza Trucks of Canada warranties all workmanship, mechanical, electrical, plumbing, propane, woodworking, metal fabricating, and flooring, for one full year. Manufacturers warranties and manuals will be in your truck operations manual. All warranty work must be approved prior to work commencing. Such warranties will be void if the damage to the components were caused by neglect of the owner. All interior food equipment, if supplied by Pizza Trucks of Canada Inc, comes with a full one-year manufacturers warranty.